For some reason, I have been rather emotional as the year comes to a close this is not something normal. First, note I am writing this the week of Thanksgiving there might be some changes later, but I highly doubt it. 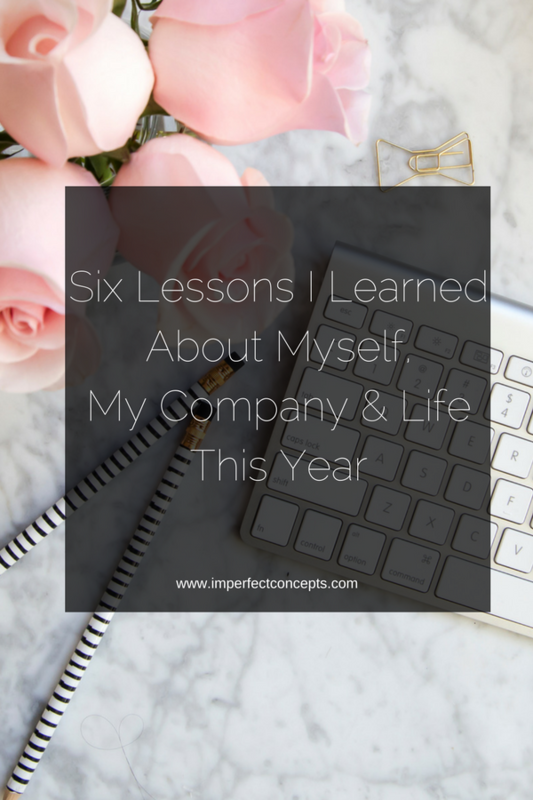 Today, I want to share my six lessons I learned about myself, my company and life this year. Earlier this year, I discovered my bookkeeping software had been reporting the wrong numbers in a couple areas. The moment, I found out I cried. This is not a good feeling as a small business owner. Let me point out it wasn’t hugely different, but it was a difference that I should’ve noticed. I was trusting technology with my money and not thinking it through. Everything seemed right for me. That is why I decided to make a financial planner for small business owners to use. It’s time to understand how my money was coming in and going out. Management of my money has not been some natural feat, as I am a spender, not a saver. However, that error stuck with me for some while and made me emotional this year when it came to my money. If you’re not great at money, I highly suggest you get your stuff in order. Find a bank you love, start budgeting, establish a relationship with a banker, save, utilize the right tools and ask questions. I feel a lot better about my money. My goal is to have a year of living expense saved next year. The money thing did through me for a loop, to be honest. For a couple of days, I cried and was upset with myself for not taking a closer look at my money. I had to realize what was important in my business. There are millions of people wanting to launch a business or grow their current business with the help of a consultant. I was stuck on other people having clients and me not landing new clients. However, what I should’ve focused on was I had had the same clients year after year with little dropping off. That’s amazing, to be honest. In addition to that, introducing bold actions and removing the limits from my business helped me gain new respect for what I want to achieve. Going into 2017, Business Bestie has a nice advertising budget that I will be able to use to help women connect. Hopefully, I will be able to visit a new city once a month next year to promote it. Too many times we are hurting, and we do not share with others. Someone might ask us what is going on and we say we are okay when were not. If I ask you how you’re doing, I am asking because I genuinely care for you. Millions of people worldwide are suffering from depression and more. There is a stigmatism attached to it where people don’t seek help because they feel judged. As someone who has a mother who is mentally ill, I take depression and other mental illnesses verse serious. If you’re not okay, take the time to decompress. We do not have to be sunshine and rainbows all the time. Know rainbows come after the storm. I never believe it’s okay to give up on your dreams until you learn how to pivot. Too many people are starting a business, but not seeing immediate traction, so they give up. Most times business owners are not looking for the solution to the problems that right before them regarding their business. Or their business is not super niche down, and so they are trying to cater to everyone. The craziest thing you will learn regarding business is finding your true loyal audience. For example, I had a client who was focused on reaching everyone when it came to website design. Instead of focusing on their local market. They were consumed with having clients all over the world, having large social media following and being this expert. Instead, I stirred them to focusing solely on clients in a 75-mile radius of their house. Now, they are booked until March 2017. When it came to my business, I stopped abruptly making digital products. Mainly because everyone was and my heart was no longer there. I pivoted to solely focusing on free content creation, this blog and servicing my monthly clients. After spending thousands of dollars into Kick Start Your eCommerce, it was a bust, which taught me how to pivot really. I am reworking the program, or better yet I am closing the program and reworking the products to fit my audience and future audience. First, I love living in a relatively small town, but I miss having my friends physically near me. Then I realized I have a community around by my clients I work with on a monthly basis, friends that live near and far, and my social media community. Funny, one of my closest friends lives in Japan, and I have known her for almost seven years, but we have never met in person. Making friends as a socially awkward adult can be hard at times, but this the main reason, I established Business Bestie. So, women can form a community around each other and support each other. Having friends not only being there for funny meme’s I send but to pray with me, let me crash on their couches when I am in town, and more has saved me. It makes me wild ideas I share with even more beautiful when the world gets to see it too. At the start of the year, my consulting company was making $5,000 a month with clients on retainer. Which is amazing to have that type of income come in. However, clients would break the contract; contracts would end, or a client was just a nightmare that income went down drastically. One of the greatest moments of this, was me learning how to live on the zero budget method. It also taught me that having a solid stream of income is important. Creating contracts with bigger companies was one of the major points for me. This meant stepping out my comfort zone and pitching these ideas to them. This year was a beautiful crazy year of self-discovery in many areas that I am very thankful for all the lessons I learned. Going into 2017, I plan on staying focused on my goals and moving forward. Make sure you take the time to reflect on your year that way the mistakes you’ve done this year will not happen in the new year.